The SMPS Principals Roundtable Committee hosted its first event of the 2010-2011 season at the Sheraton Hotel in Reston on October 21st. Opportunities and challenges faced with data center development in Loudoun County were the focus of the event, which was headlined by an esteemed panel of experts with diverse backgrounds, who shared their insight to a crowd of over 40 executives in the A/E/C industry. Panelists included, CBRE Director, Jerry Reich (former Caps player), Loudoun County Economic Development’s Buddy Rizer (former DC101 program director), DPR Construction Project Executive (and Yankees fan), Brian Brezovsky, Digital Realty Trust Director (and data center technology guru), John Litvany, and PageSoutherlandPage Associate Principal, Michael Mace, who we discovered has led many of the largest semiconductor and data center projects in Texas. 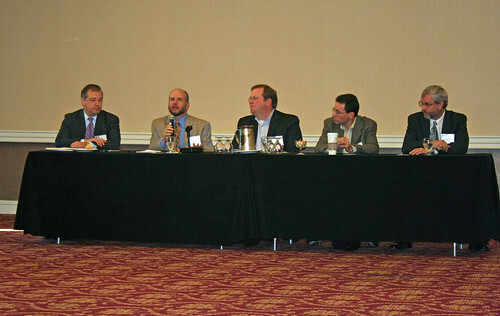 The panel was quick to identify the key factors for data center site selection. Operational cost and risk were the first priority discussed, including the opportunity to take advantage of mid-Atlantic seasonal temperature changes that can greatly affect operating budgets. With data centers consuming approximately 20% of the nation’s energy supply, this is a significant advantage of Loudoun County’s geographic location. In addition, Loudoun’s existing infrastructure is viewed as very beneficial with basic utility connection fees (using reclaimed utilities) that present approximately 60%+ savings as compared to competing regions and municipalities. Loudoun County’s Buddy Rizer shared that risks are low for building in Loudoun County because the Economic Development staff are committed to working with corporations and are efficient in the process of developing these structures, due to the large number of clientele they have already serviced. In addition, the saturation point for data centers in the County is nowhere near the threshold, based on the availability of land and reclaimed utilities, as well as redundant power reliability. The panel also left attendees with several technology drivers for the future of data centers, including, technology (less space requirements for small servers, etc. ), A/E/C design (move to multi-level structures), and European influences that will have an impact on more savvy owners and operators, such as segregation of cool/warm areas and use of hydroelectric power. Lastly, CBRE’s Jerry Reich offered the following “game changers” at the conclusion of the event, which offered unique insight to the future of data centers nationwide. At the end of the morning, attendees and panelists alike were able to benefit from this exclusive information sharing session. With all of the knowledge shared, it was evident that only time will tell what may drive the future of data center development in Loudoun County and the nation as a whole. But rest assured, there are an abundance of local firms that are eager to lead the charge.